Major depressive disorder (MDD) can be debilitating and painful both emotionally and physically, filling the body with aches, tension and unexplained pains. The last thing a person with depression wants to do is to add more pain into their lives; there is a need for a treatment such as TMS that is localized, harmless and effective. Patients who undergo treatment describe it as a tapping sensation on the forehead. TMS therapy gives people a hope for treatment without pain. It was cleared by the FDA in 2008 as a therapy for treatment resistant depression (TRD). Those seeking help for TRD can rest assured that a majority of patients have a comfortable experience throughout their sessions. Some people occasionally report feeling a slight headache in the first couple of sessions or slight dizziness but these sensations are moderate and typically subside with 1-2 aspirin or Tylenol which are always available on request. As patients continue with treatment sessions, the experience becomes more comfortable and relaxing as patients are encouraged to watch relaxing videos, listen to music or meditate. Trained and certified technicians are present at all time to help ensure that each patient’s experience is as comfortable and pleasant as possible. They give guidance to patients throughout treatment sessions and are there to answer any questions or concerns. Unlike medication, the side effects with TMS are minimal and limited to the transient headache and occasionally a passing sense of dizziness. In contrast, medications have systemic side effects from chemicals circulating through the bloodstream and reaching all parts of the body. Side effects can include weight gain, sexual dysfunction, and extreme fatigue. Experiencing side effects is one of the main reasons people cannot tolerate antidepressant medications; indeed, they make them completely unusable for some. TMS is a boon for those who do not respond to antidepressants as well as those who cannot tolerate their side effects. Because antidepressants do not work for everyone, and also come with a wide range of systemic sides effects, TMS is an essential tool to help patients achieve complete remission from depression without the side effects that impact all aspects of life. TMS is a safe way to stimulate underactive areas of the brain associated with depression. It requires no sedation or invasive surgeries. Though the sensations are unfamiliar, TMS does not cause any physical harm to the body or brain and has been proven safe, well-tolerated, and effective even in vulnerable populations such as the elderly. Adolescents and children are more likely to experience discomfort, but most have a comfortable experience. In one study, only 2 of 56 subjects(3.8%) aged 7-18 were unable to tolerate TMS due to pain. These subjects did not experience lasting pain or side effects. Interestingly, they also had a history of anxiety. TMS is appropriate for use across many lifespans, and for many different populations. TMS treatment sessions take place in private room where patients sit in a comfortable chair. Technicians are personable and trained to ensure that patients have a pleasant experience. A TMS physician places a Brainsway™ dTMS cap on the head. This device contains an H-coil which delivers very short bursts of pulsing magnetic currents to the DLPF area (dorso-lateral prefrontal cortex) of the brain. Patients are fully awake and aware for each 20 minute treatment, experiencing a slight tapping sensation on the head. Patients return to their normal daily activities immediately. . Treatment sessions typically continue at a rate of 5 sessions per week for 4-6 weeks. Most people experience a gradual improvement in mood and depressive symptoms beginning in the second week. The brain is made up of an estimated 100 billion neurons (cells of the brain), each connected to up to 7,000 other neurons. Neurons communicate with each other using chemicals called neurotransmitters. The healing power of TMS lies in its ability to stimulate neurons, normalize the concentration of neurotransmitters, and rewire the connections between neurons to contribute to normal functioning. 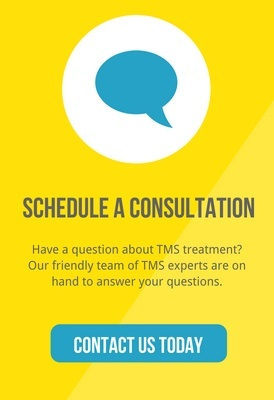 TMS uses non-invasive magnetic pulses that pass through the scalp to stimulate neurons in the limbic system, an area of the brain responsible for mood regulation. This brings about improvements in mood and depressive symptoms. This technology is effective, with one research study showing symptom improvement for 58% of people and complete remission of symptoms for 37% of participants. Physically, depression is associated with unexplained aches and pains in the body and people with depression can have a difficult time maintaining physical health. This pain may be one of the first or perhaps the only recognizable symptoms of depression. Emotionally, depression can wear a person down with intense feelings of despair. People with chronic pain are three times more likely to suffer from depression, and people with depression are three times more likely to experience chronic pain. The debilitating effects of depression often leave people feeling hopeless, distressed, and overwhelmed. TMS is a harmless, and effective treatment for TRD. Please check with your doctor or therapist to see if it’s right for you.